Find the stone that speaks to you. STEP ONE - Start With Your Stone! You can change the color of your cabinets but how do you you change the color of your countertop? To walk you through the selection process click here. Ask for a Stone Specialist. Mystic has a vast collection of budget friendly basic stone to premium exotic stone products that are showcased in a clean, indoor 53,000 sq. ft. showroom and gallery. Darlene Spezzi, Owner/CEO, personally hand selects materials from only the top 10% produced from the world’s most reputable quarries. Let Mystic’s Stone Specialists help walk you through the process of bringing the timeless beauty of natural stone to your application. We work directly with homeowners, designers, cabinet companies, builders and architects. Your kitchen, bath, great room, bedroom – anywhere you want to add warmth and a captivating appearance is the right place to install natural stone! Our experts can help you learn all about stone and how you can transform your space with marble, granite, quartzite and many more stone choices! Everyone says they have the best stone selection, they’re the largest and the most affordable but come see for yourself what Mystic has to offer before selecting anywhere else. 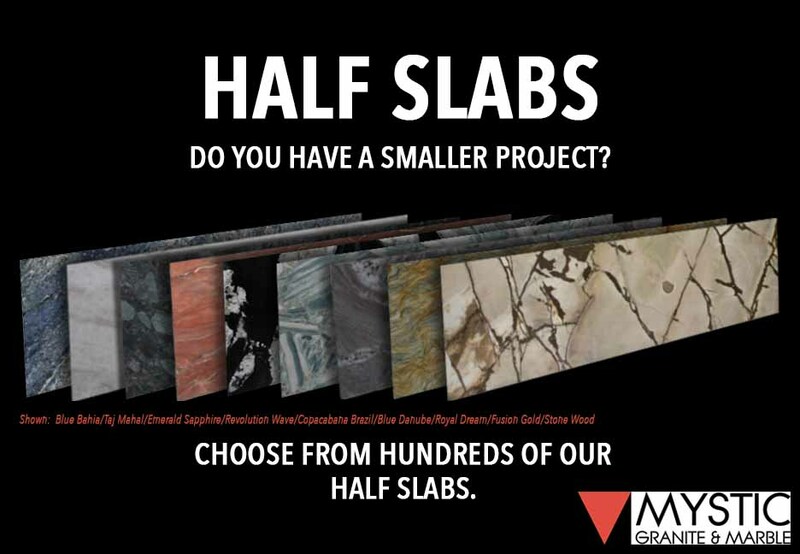 If your application does not require a full slab you can choose from a selection of existing half slabs. Please ask a Stone Specialist how our Half Slabs can save you money! or stop by Mystic today!